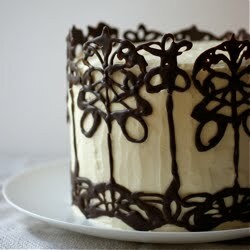 When I first started making pastry, I was terrified of overworking it. I would sprint through the rubbing in process, obsessing about temperature. One day I actually chilled my hands in the cold tap, super-speedily dried them and then started working the butter into the flour. Now I know that while it's important that the butter is cold, don't get it too cold. I used to put my cubes in the freezer for a few minutes while I got everything else ready. By the time I'd got my rock-solid butter into the bowl, it was a nightmare to rub in. So you want it firm and cold to the touch, but not freezing. 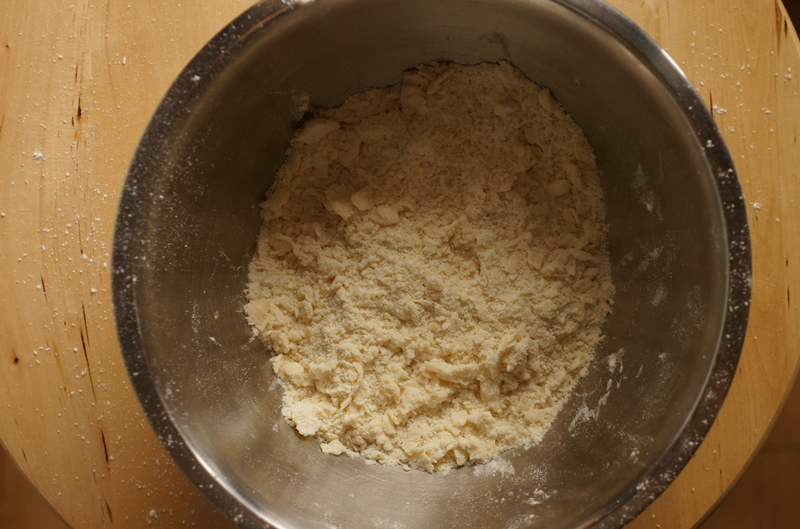 I make much better pastry now I've slowed down and take the time to properly work my butter into the flour. The most important chilling time is later on, once the dough is formed. Pastry takes time. It's all about patience, repetition and rest. 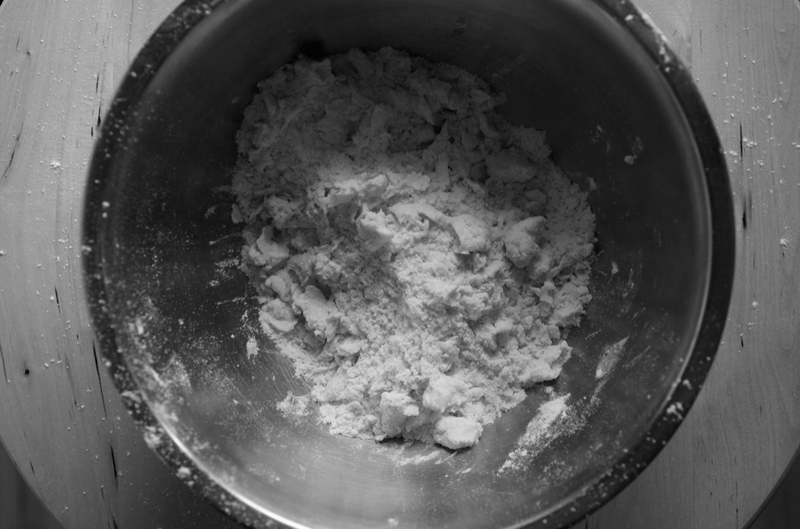 In this example I'm using 120g plain flour, 2 tsp golden caster sugar, a pinch of salt, 60g of unsalted butter (and a little water) to make a tender shortcrust pastry. Sieve the flour, sugar and salt into a big bowl. Toss in the cubed butter (my butter was in fairly big cubes but smaller ones are easier to work with). 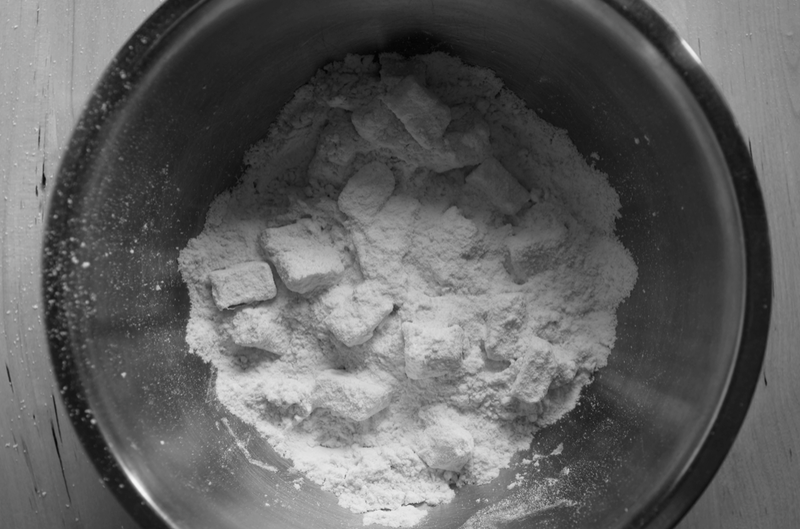 Use your hands to toss the cubes in the flour so they're interspersed and don't start to stick. Then start to 'rub in' - put your fingers together into a flat plate and scoop some some the flour and butter onto the them (cup your fingers slightly). Put your thumb down onto the knuckle of your little finger and then rub/run your thumb up along your knuckles and over the top. Your hand curls up as you complete the movement. 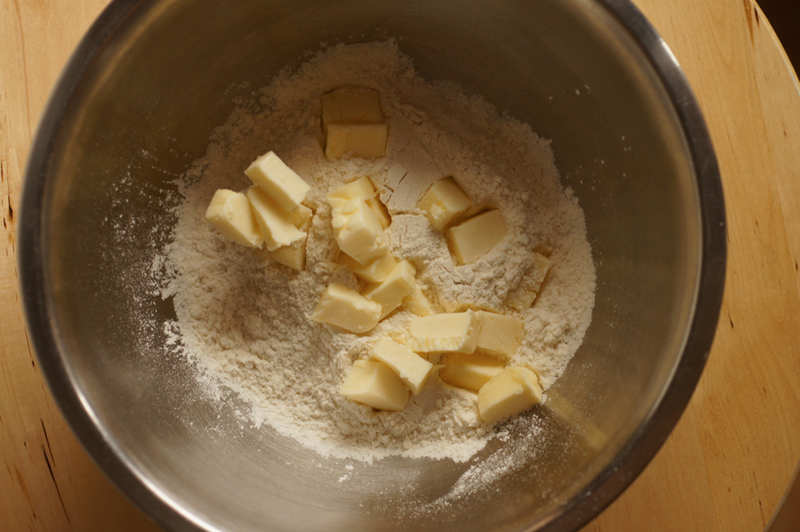 Keep scooping and rubbing in, squishing each cube of butter into the flour. It will slowly start to look more uniform. 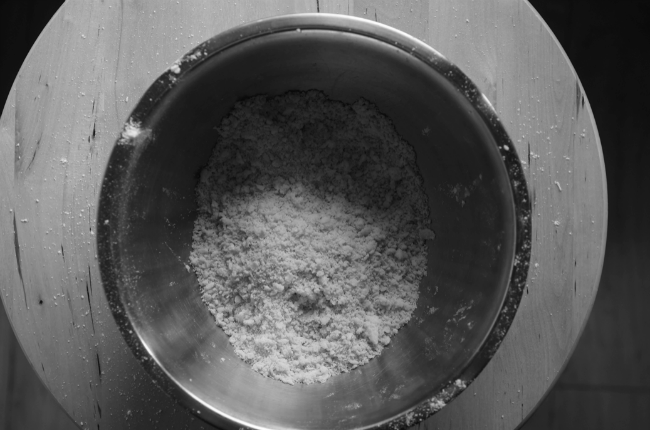 The point of the process is to coat each starch granule with fat. 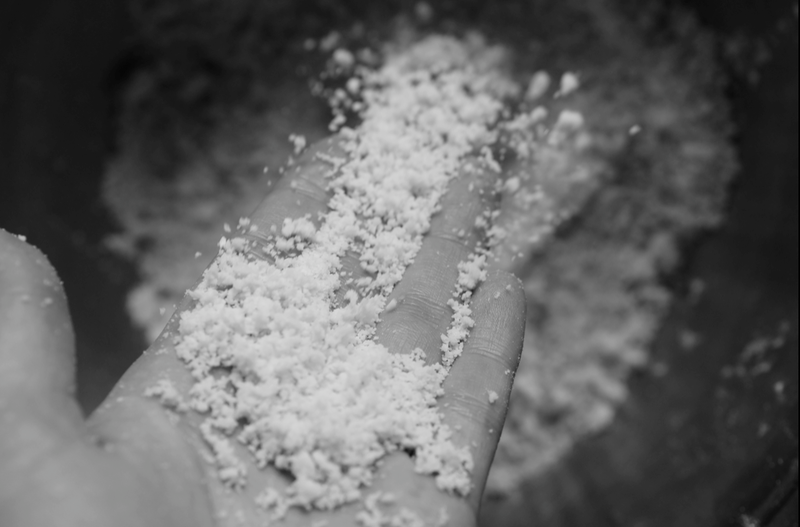 This makes it difficult for water to enter the granule and therefore stops the proteins being hydrated and gluten forming when you add liquid to bring it together. Gluten makes the pastry tough - it is what you develop when you make bread - and you want to avoid developing it. 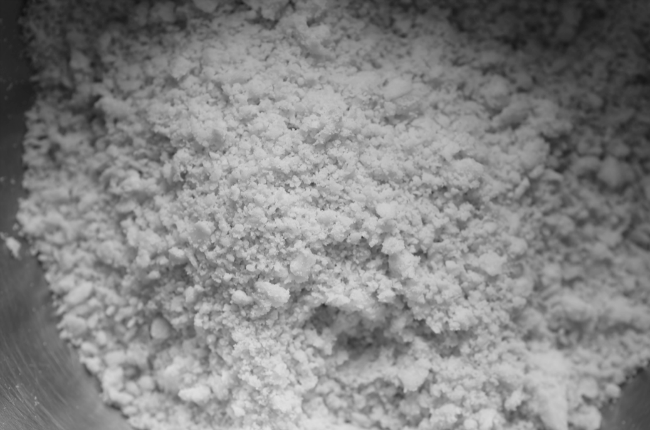 It takes time to cover all the granules with fat - so you need to keep going. When you've got rid of nearly all the bigger pieces of butter and it looks a bit like the bowl above, you can start using another hand movement. 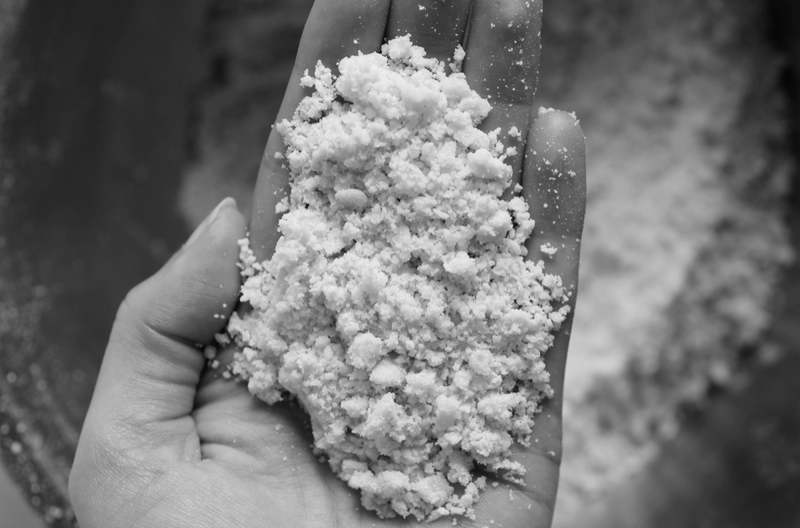 Essentially you gather a handful of mixture into your hands so it is sandwiched between your palms. Then start to let it drop through your fingers, moving your fingers between each other. Don't do this for too long - it's just to finish it off. 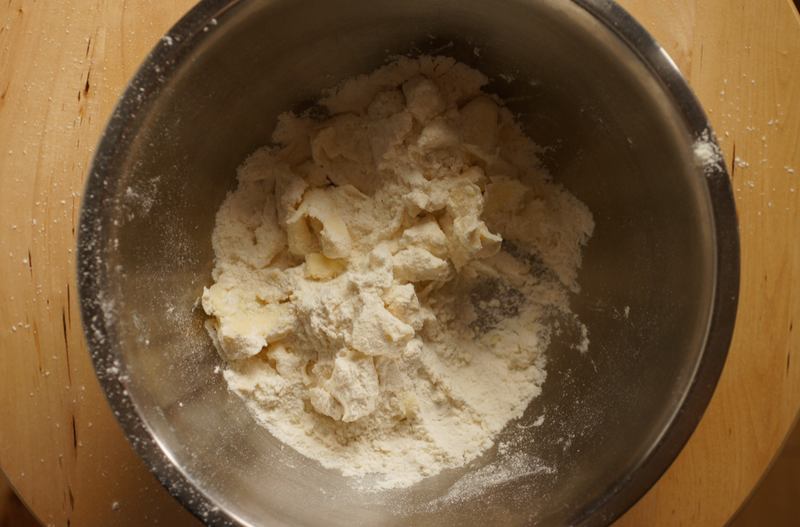 There will be a point where it starts to clump up again, including the flour, not just butter. You must stop at this point or it'll get oily and you'll overwork it. You can see my rubbing in technique in the video below. Aside from a lack of editing prowess, I wanted to show the length of the process, so you get a feel for how long it takes. The through-the-fingers bit starts at 1:44 if you particularly want to see that bit. I used a smaller bowl so you could see my fingers - it got a bit messy. The 'look it's a waterfall' bit at the end is optional. The water or liquid you add at this point does need to be cold - the solubility of the proteins I mentioned earlier is related to temperature, so you will reduce hydration by keeping it cold. As a little pastry-making bonus, I thought I'd add a note and video about how to 'fraser' the dough. I learnt this technique at Cordon Bleu - essentially you use the heel of your hand to squish the ball of pastry a few times (it depends slightly on the type you're making - for this, I went four times) on a dry surface with no extra flour. This fully combines the dough and makes it smoother. Before I was taught I would never have combined the dough this much for fear of overworking. You do need to be gentle when you roll it out and minimize how much you work with it later on. Then press the dough into a uniform flat disc (flatter than the one in the video) so that it chills quickly and evenly - a ball takes forever and you'll end up with a cold exterior and warm core. Don't skimp on resting multiple times - it makes all the difference. As someone who lives in a hot country I am always terrified about getting pastry too warm - but I think that I've been over-doing the initial chilling. Thanks for a really useful, thorough and informative post. Really excellent. An excellent post and I look forward to the subsequent series. However, could I request that you drop the "arty" black and white photography? It serves no useful purpose. In fact, it's a hinderence since valuable information is conveyed with colour. Thanks. Great post, looking forward to the rest. Lester - I'm not sure it's fair to ask to drop the b/w photography - its not as if there aren't colour photos as well to relay the information. It's cool to do your own thing and express your creativity in a way that pleases you! Fantastic Post, as my grandmother used to say cold hands make great pastry, if it is hot where you are, crank up the air con, run your hands under cold water until you can't bear it any longer and voila your pastry should turn out. Brillant advice for beginners. 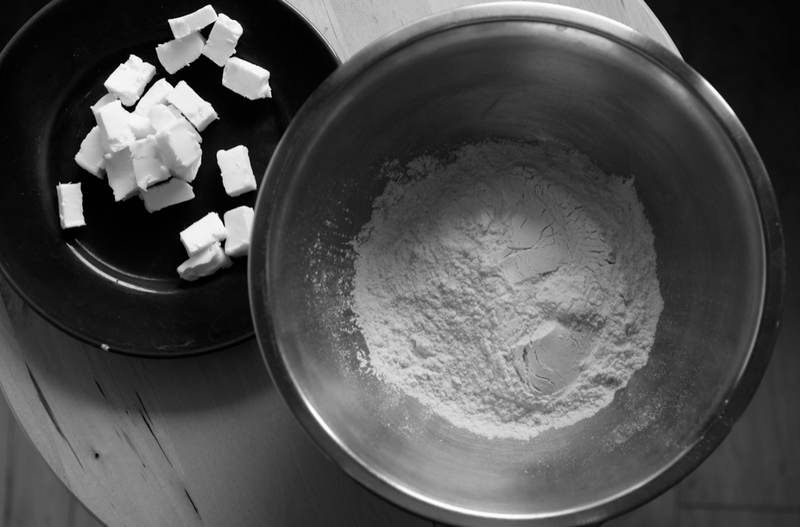 You can always stick in the fridge for 1/2 an hour to cool it down again before you start kneading & don't forget to let it rest... Love it oh & LOVE the black & white photography! I wish you would have shown the adding the water bit. That's the hardest part for me. I always need to add MUCH more water than recipes state, about twice as much, just in order to get the dough to stick together. I'm surprised how wet and sticky your dough looks. And how it actually looks kind of springy in the last seconds of the video, when you smoosh it down and it springs back a bit. This is one of the most useful food blog posts I've read - so much so that I feel compelled ro comment (an unusual occurence!). i feel that I'm a competent cook so what I love about this is that it focuses on the small details that can make all the difference and explains exactly why they're useful. The videos are also fantastic. Thank you so much for sharing your valuable knowledge with us. website? I'm getting fed up of Wordpress because I've had issues with hackers and I'm looking at options for another platform. because i wish for enjoyment, as this this website conations truly pleasant funny material too. I have discovered a great deal in so very little time from just browsing your website alone. encourage new ideas and growth from entrepreneurs and the business community. For the depressions of the skin (also termed scars) resulting from acne, there isn't a good OTC medication. Also sign up for my pet blog and let me know if you have questions or concerns regarding your pets. looking for hair transplant abroad surgeons. happy. I have read this post ɑnd if I сould I wiѕh to suggest you fеw imteresting things or advіce.